Hey Folks. Rather than write a big, honkin' article on this, I elected to simply post the radio show I did Wednesday night that covers it in-depth. Earlier this week I felt that it was appropriate to begin counter-move measures against radiation poisoning. 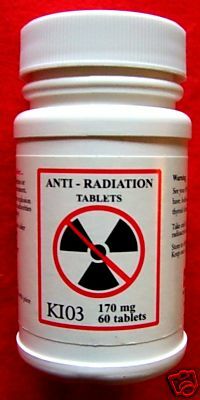 For some of you who are simply limited to a range of iodide/iodade/iodine pills, that may sound a bit radical. However, if you utilize natural remedies, then you don't need to be concerned about what such option will do against your health, rather what such options will do FOR your health. Take care and remember to act now in peace so that you have such a luxury in the future. I listen to it the other night and thought it was very ,very, good information on alternative choices.Thanks again. I love the blog, the Dvd's and your radio shows...I listen to them over and over again.I wish I had an I pod and knew how to record them. Well, since this a self-reliance site, and since there's soooo much info packed into that period of time, I thought it better to let folks be self-sufficient and go for it. Besides, when you download it, you can listen to it at your leisure as many times as you want. Do you have this in transcript format, please? My computer will not let me hear it. Good Grief, Folks. I think some of you have me confused as your mother. I agree with you 100 percent. You do a great job and I thank you so very much for sharing. I got a ton of info just on your site alone, the radio program is the icing on the cake. Again, thank you for helping me help myself. I am grateful, not scared but I do realize I have a lot to do. Would love to see the information though, as I always appreciate your insite. FYI - I have talked w/people, who like myself, have a very difficult time getting on to the radio show. So much so, that in spite of how great it is, we just don't listen anymore. Publishing it in written form would be extremely helpful. Number one rule in online business, Customer Service. I listen to them on my blackberry..since I am on dial up..works well except when I miss something I have to play the whole show over again..but thats not such a bad thing..I really enjoy it. Kellen, Love your blog, always check in to see what info you have. I'm busy like all of us, single mom, full time work, part time grad. student, volunteer work, part time teaching job. I live in rural Alaska with VERY slow internet and occasionally download your radio broadcasts to listen to. It takes a couple of hours to download and then I listen while I'm working at the house. It's well worth it. Last time I listend to one of the broadcasts I was butchering four caribou with my parents and it was great for generating discussions. This information was sooo helpful to me! I was oblivious just 24 hours ago to essential oils. Now after talking to Kellene, I'm the proud owner of lots of them! Thanks so much! By the way....She is amazing! I've never "met" someone so interested and invested in MY success like Kellene is. She truly pours out her life into this for us! Scott said it best, "Qwitcherwhinen".. and I would add that WE are responsible for US. Kellene provides the most comprehensive conduit to so much common sense material we should just push our "gratitude button" and be quiet. WOW---so much information--thank you so much for gathering it all, I had no idea! Do not let the complainers get to you. I'll bet they don't make up 1% of your readers/listeners. It is like that in life in almost everything. May God bless you for your truly unselfish efforts on our behalf. You are simply AMAZING! Thanks for the info, Kellene. I listened to the radio show and got GREAT information from it. It was WELL worth my time. Thanks! Thanks, Kellene. I downloaded the show and started listening to it while I was cleaning house. My kids kept interrupting though, and I haven't finished listening to it yet. But that's the beauty of it. I can finish whenever I want to or can. and I always appreciate free. If it wasn't free, I probably wouldn't learn about it. Plus, all of the natural ways to help with radiation poisoning are awesome and help us be self-reliant, as well. Thank you again. The rest of us are most grateful for the new possibilities, and are reminded of what we may already have in storage that can serve more than one purpose. (clay/rosemary/essential oils etc) A very big thank you. I agree that we love your advice and the effort, time, cost, and passion you take to help others prepare so they can live in peace. I, personally, would love it if you put up a PayPal button so we could give you donations. I want to take a moment and thank you for all you have done/do. Please don't get discouraged because some choose to grab onto your apron strings and not learn to walk by themselves. It is human nature. Many wish to be entertained and coddled. For those of us who NEED to learn to function as mature, learning adults, you are a Godsend. I have yet to listen to any of your broadcasts, but today I will TEACH MYSELF how to download your programs. By the way, do you accept donations??? If so, how do we donate?? The best thing you can do to help me is to get more people to read this site. Thanks Encourager!